Are you getting enough Vitamin K2? If you are eating a Western diet, you likely are not. Vitamin K occurs naturally in two major forms — Vitamin K1 and Vitamin K2. While Vitamin K1 is found in green leafy vegetables, such as broccoli, spinach and kale, and is easy to incorporate into one’s diet, the more beneficial Vitamin K2 is of bacterial origin and much more difficult to obtain through diet alone. Therefore, the daily requirement for Vitamin K2 has to be gained from dietary sources, and the most popular sources in Western diets are curd, cheeses, and other fermented dairy products shown to contain Vitamin K2. But one needs to consume extremely high amounts of these foods daily in order to get a sufficient Vitamin K2 intake. The best source of Vitamin K2 is a traditional Japanese dish made from fermented soybeans called natto, which is uniquely rich in menaquinone-7 (MK-7).11 As natto remains unpopular in the Western world, supplementation with additional Vitamin K2 is viewed as the optimal alternative. In general, the typical Western diet contains insufficient amounts of Vitamin K2 to adequately activate the K-dependent Matrix Gla Protein (MGP), which means about 30% of Vitamin K2-activated proteins remain inactive. This amount only increases with age. 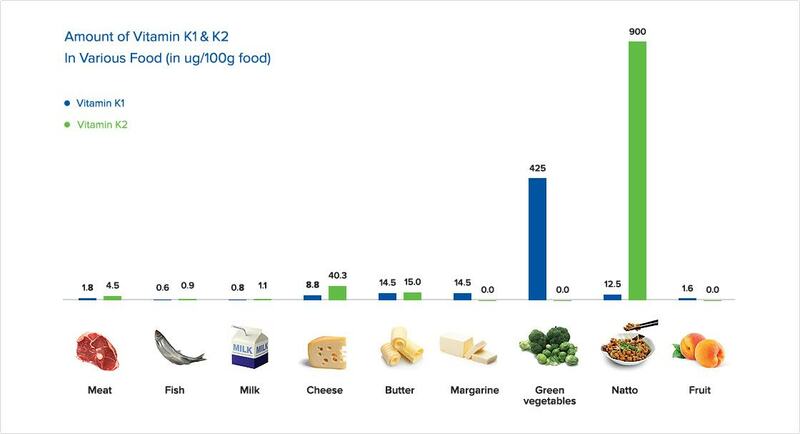 Further, Vitamin K2 is nearly non-existent in processed “junk” food, and even in a healthy Western diet. Also of note is that there are currently no recommended intake levels for Vitamin K2 – the only recommended levels are for vitamin K1.